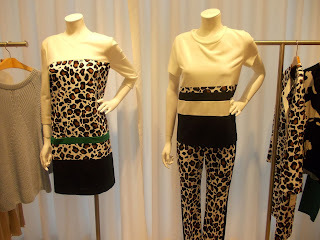 I fell in love with the Marc Cain brand since when I've seen it for the first time few seasons back and every time there are few things that I add to my wish list. For the Spring Summer Collection 2014 I've seen quite a few items that tickle my fancy. Look at the beauty of this soft leather and calfskin nappa jacket. The colour and the model is gorgeous and it is just what we need for our temperamental weather, even during the so-called hot months. This look taken from the Marc Cain catwalk has been styled with a great animal print skirt and the pattern is part of a line from this collection with a dress, a pair of trousers and a jacket. The ankle boots in nappa and the little clutch bag finished the look. I love this leather jacket in lambskin, the pattern is great with this warm toned hounds tooth. A range of accessorises with the same pattern is available by the way. Here a great sequinned top is styled together with a micro fibre skirt and a pair of great sandals and a beautiful clutch bag in goat nappa. This little number is lovely, the short sleeves sweater and matching skirt in a mix cotton, linen and just a drop of nylon in order to give that extra stretch, are very versatile and just playing with accessorises the outfit can be worn at work or for going out. The calfskin nappa ankle boots have got a slender but strong heel that elongate the leg. Turquoise is such a vibrant colour that immediately brighten up the mood. 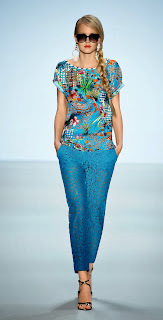 The silk top with this tropical print is easy to match with anything in your wardrobe, giving a twist to a dark suit, or a pair of navy trousers, or a denim skirt, the choice is endless. The beautiful lace trousers are a kind of signature piece for Marc Cain because I've remembered seen a previous collection for a the winter season with a pair of beautiful olive green lace trousers.